Spring-cleaning season is here, so it’s time to break out all the essentials! 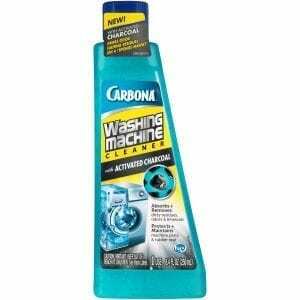 From the laundry room to the living room, Carbona has everything you need to get rid of those winter stains and refresh your home for the sunnier days ahead. Let’s start from the ground up and conquer all those dirty, snowy carpet stains the winter (or your pets) dragged in. Whether for small stains or large, high-traffic areas, Carbona’s oxy-powered carpet cleaning solutions with active foam™ technology will refresh your flooring in no time. For tough spot stains, we have two products that feature a unique multi-material brushtop applicator that provides 2-in-1 stain removal. The sponge cleans surface stains and odors while soft bristles reach into the carpet fibers for a deeper clean (so that wine stain from New Year’s Eve doesn’t stand a chance!). If it’s the entire rug or carpet that needs attention, our Steam Carpet Cleaner can remove stains on a larger surface when used with a steam cleaning machine. Dirt and spills: Eliminate common tough stains—like juice, wine, and coffee spills and shoe tracks—with Carpet Cleaner. Wall-to-wall carpeting: Steam Carpet Cleaner will take care of deep cleaning your carpet for a bright new spring look. When was the last time you cleaned your washing machine? If the answer is “never,” now is the perfect time to breathe new life into your laundry routine. Washing Machine Cleaner with Activated Charcoal ensures a complete machine clean by attracting and binding odor-causing residues, dirt, and limescale. Hint: Use this cleaner to wipe down the detergent tray and rubber seal that tends to collect extra grime and stain residues! Dirty fingerprints, grass stains, and dropped ice cream…oh my! 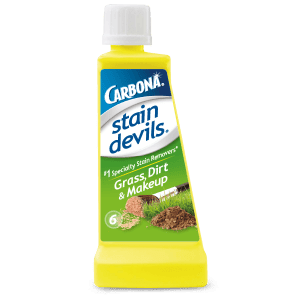 The spring stain possibilities are endless, which is why Carbona has a line of 9 stain-specific formulas to remove them all (including blood from those scraped knees during that picnic-turned-basketball tournament). 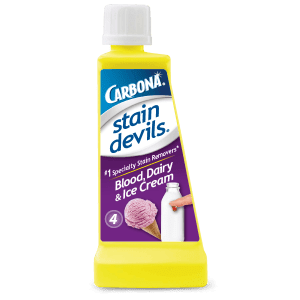 No matter how you plan to take on the spring, Stain Devils #4 and Stain Devils #6 are must-haves for you and your kids. From cleaning up after a family brunch to preparing your washing machine for all the sports stains ahead, together let’s make this the cleanest season of the year.